There’s a lot of reasons to go to Bebek Bengil, but all of them are overshadowed by two words: bebek tutu. We investigate the life-changing properties of smoked duck. One of the classic elements of cooking Balinese food — and really, most places in Asia where a recipe gets passed down over generations — is that you learn to prepare and serve one dish, and you put your heart and soul into making it absolutely mind-blowing. This wasn’t just a point of pride, though it was most definitely a point of pride for the chef, it was a matter of survival. If you served a smoked duck it had better be the best smoked duck, because somebody else will be selling the same dish a few streets over . 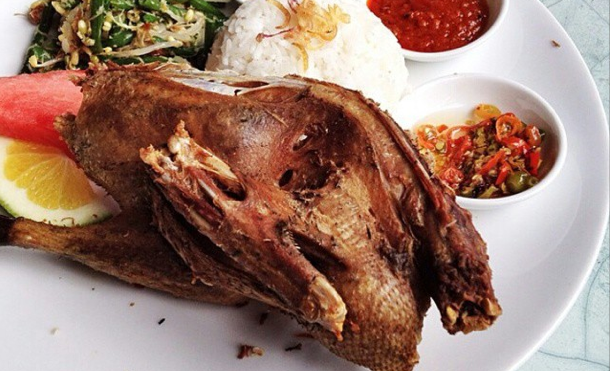 Bebek Bengil comes out of this cutthroat, classical Balinese culinary tradition. They don’t just cook smoked duck, they cook smoked duck like their lives depend on it. Which is not to say that all that Bebek Bengil prepares is smoked duck. 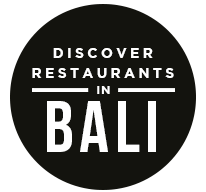 They also serve a crisp roasted duck, a grilled duck served with incendiary-level green sambal, a fried duck served in a traditional Indonesian fried rice. They serve other dishes, too! And they’re all great, but what they do with the preparation of bebek tutu — literally, ‘smoked duck’ — is what has made them local legends. The fowl is rubbed with a mix of Balinese spices, and then tightly wrapped in betel leaves. Placed over an open fire, the duck is slow-cooked over the course of the day, making it both incredibly tender and taking on some of the aromatics of the smoke. The final product — because of the preparation time, a 24-hour pre-order is necessary — is a meal that is totally unique, both in Indonesia and in world cuisine. Restaurants like Bebek Bengil are standing up for centuries of food history by doing what they’ve always done and doing it the best. Because if you’re going to do something, what’s the point of doing it halfway? For more photos, menu information, or to reserve a seat tonight at Bebek Bengil, go to Qraved.com or use our app for iOS and Android. The post Yes, Bebek Bengil Is That Good appeared first on Qraved Journal.